Wow! What happened to 2017? My last entry was on Feb of 2016 and promised that I would post somewhat regularly in here. Turns out, I'm living life. But you may ask, haven't you been doing that since the inception of this blog? Nah, I'm talking about real life: with responsibilities. Travel was the main highlight of 2017 with me taking every opportunity during the days I wasn't at work to explore new places in the world. On one side of the globe, I went to Paris and on the other, to New Zealand, with numerous other places in between. Life was good. But, it was about to get better, in a sort of different way. On September 6th of 2017, my other half and I closed out on a $350,000 two bedroom, 1 and a half bath, 800sqft. of our own personal space, where we can do whatever the hell we want. For once in my life, I have a sanctuary where I can just push the rest of the world away should things turn south on me. This is my first post in this blog since living in our new hale and I couldn't feel any better. 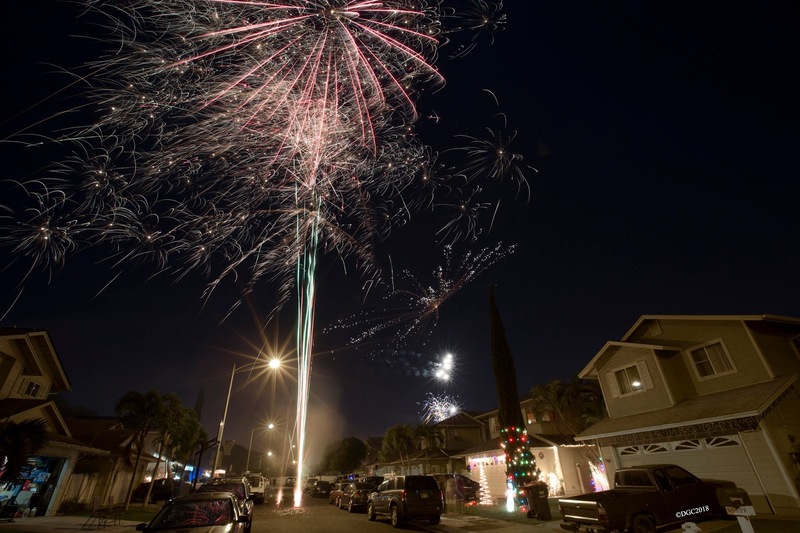 The New Year has come and gone. BOOM! BOOM! BANG! BANG! Drinks to be had, yes, the alcoholic ones. ;) I wanted to start this year off with a good start. Actually, long before the New Year, I'd say around in November or December, I was invited to an opportunity of epic proportions. One that I had read about for years, but never had the resources to gather to actually pull this off. I was invited by a good hiking comrade of mine to take a Journey to the Center of Kaua'i, a place that few has gone due to the difficulty in navigating this hike. I recently watched a 2008 film called, "The Journey to the Center of the Earth". If there was one adventure that resembled that, this would be it. Called the "Blue Hole", otherwise known as the Wailua Headwaters, this deep gorge cuts through the ancient shield volcano of Wai'ale'ale, millions of years in the making. Nestled right at the base of Mt. 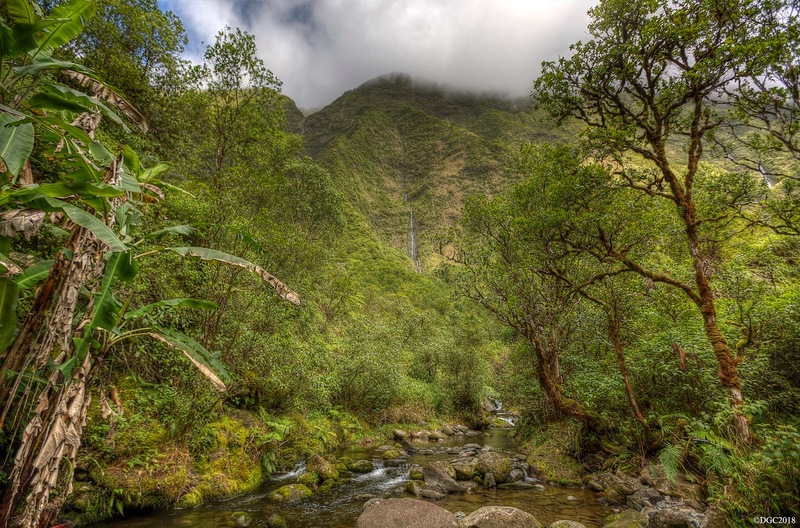 Wai'ale'ale, this place has been dubbed the "wettest spot on Earth". Or more accurately, one of the wettest spots on Earth as it trades this title with a few other places elsewhere in the world. It is said that this area receives on average of 400 inches of rain a year. But according to Wikipedia, the record is 683 inches of rain in 1982. There are numerous rainfall statistic sites that have a number of days that it rains on average. Doing a round up of all these numbers, it averages out to be around 340 days a year that it rains at this place. That's 340 days out of 365 days a year! 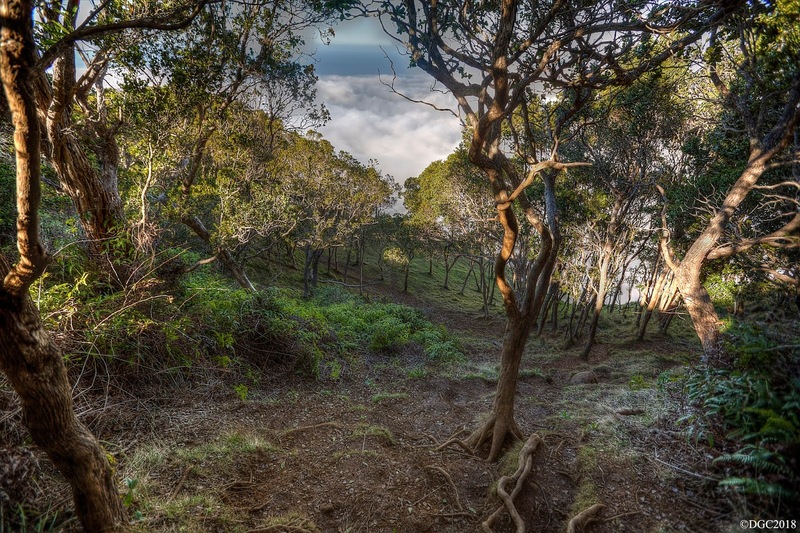 All the water from it's plateau shaped mountain top, standing at 5,148ft above sea level, drain from the Alaka'i Swamp down thousands of feet of cliffs down into a depression that resembles a crater. 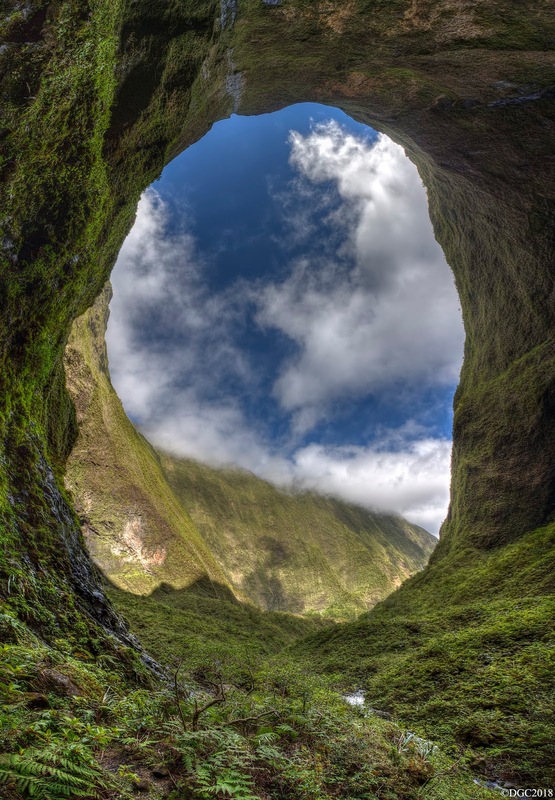 Most people mistake this area as the Wai'ale'ale Crater, but it isn't a crater at all. 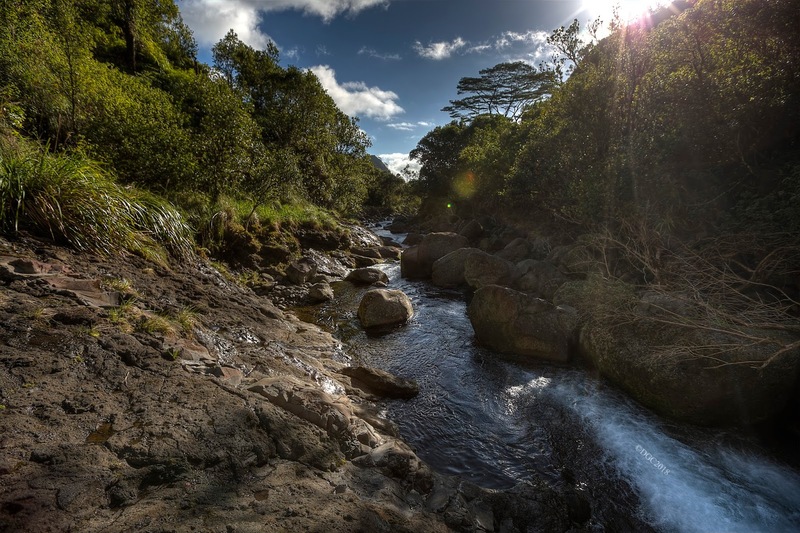 It's part of the headwaters that form the start of the gorge that is carved by the Wailua River and flows downriver towards the Pacific Ocean. The majority of Kaua'i's freshwater are probably sourced from this location. After weeks of planning and researching, I was getting a bit nervous about this trek. The general emphasis was that a large network of hunting trails exists all around this area from the trail head all the way near the back of the gorge. Getting lost here spells disaster. Also given that it is one of the wettest spots on Earth, it was safe to assume that the river flash floods quite often. There have been documented cases where heavy rain was falling anywhere around Mt. Wai'ale'ale, ankle high water would flash flood into chest or higher levels, turning the river into a raging torrent of water. Get caught here and you are in serious trouble. If one is to hike safely here, weather calls the day. This was no joke. Or at least that was what my phone was flashing before my eyes. "Let me hike Blue Hole first before I die!" ran across my mind. Without getting into much detail, someone at the Hawai'i Civil Defense messed up. Messed up HARD. Needless to say, no missile was upon us to shower us with nuclear death. But this serves as a wake up call in the current events that are unfolding. On Sunday, we were off. I say we, because Jerry decided to accompany me and be my "mobile base camp". 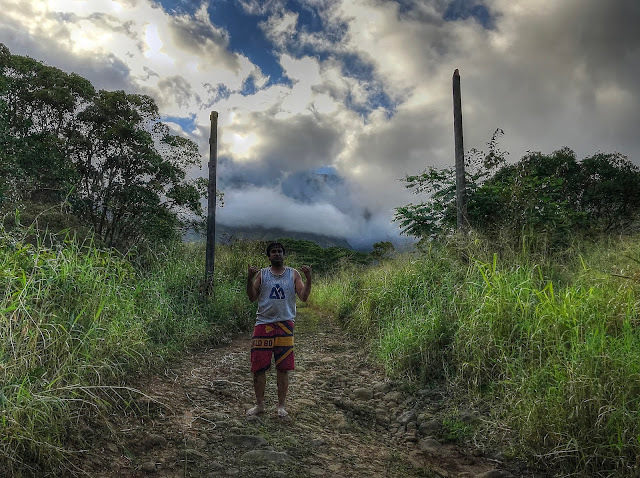 After touching down at Līhuʻe (Lihue) Airport, we met with my hiking companion, Vladimir, and decided to check out a little side hike in Koke'e. I happened to bring my drone and with the winds at light and variable, this would be my first time to cut my drone loose and fly free around me, somewhere other than O'ahu. As you'll see in the video, the views were just fantastic! This little hike was just the prelude to the main event: The Blue Hole! On the next day, we met with our guide, Andrew, who would lead the hike. Also accompanying us was Miles, another visitor from the continental U.S. to bring our hiking party to a final count of 4. But, before I continue further with this blog entry, I am going to keep the directions somewhat vague out of respect of keeping this place a pristine location for future generations to come. We started our long drive mauka. Eventually, we drove off the paved road and into a long and BUMPY 4x4 road which I would learn that it was the very same road they used in the first Jurassic Park movie where the two tour cars went through the "Jurassic Park Gate". This photo was taken after we finished the hike, hence the abundance of clouds. Finally, we got to the trail head and we left the safety of our vehicle, ready to tackle the unknown, well for us anyway. Andrew has done this numerous times and he was to be our human way finder for the day. The weather couldn't have been better. If weather was a casino, then we won the jackpot of the day! By those weather statistics, we had a 0.068 percent of scoring a dry weather pattern for the region. And we got those odds in our favor on this day! 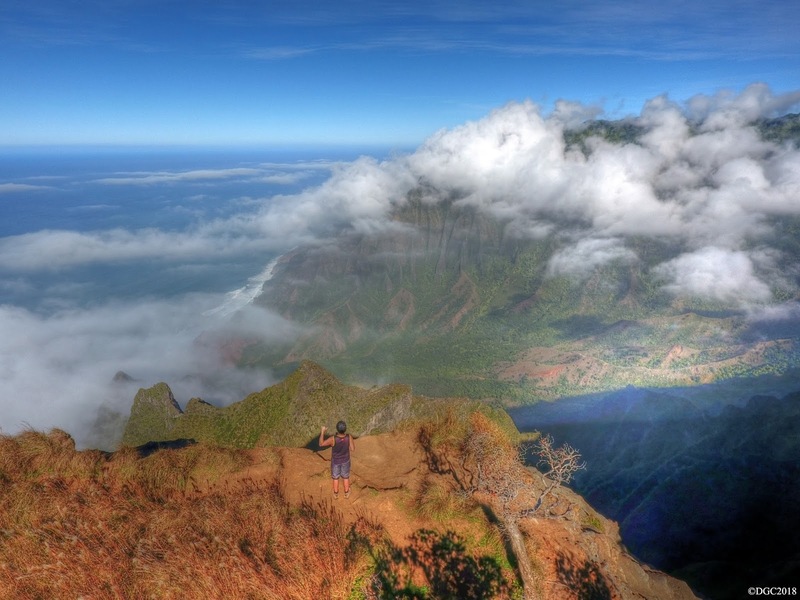 It was clear blue skies over the entire summit of Wai'ale'ale and Kawaikini with not a single cloud in the sky. We slipped on our trustworthy tabis, a definite must for this hike, and we set off. I can basically sum this hike up with a percentage ratio. It was 90% rock hopping upstream on a stream bed or flowing river. The other 10% was a mud sloth up and down some ridge spurs with the aid of some old ropes, contouring a couple of rather sketchy ledges. The first half of the hike is 99% rock hopping and 1% mud sloth through some obscure trails. Yes, I said trails as all of these trails snake out in every direction. But the general rule is to keep going up the river bed. 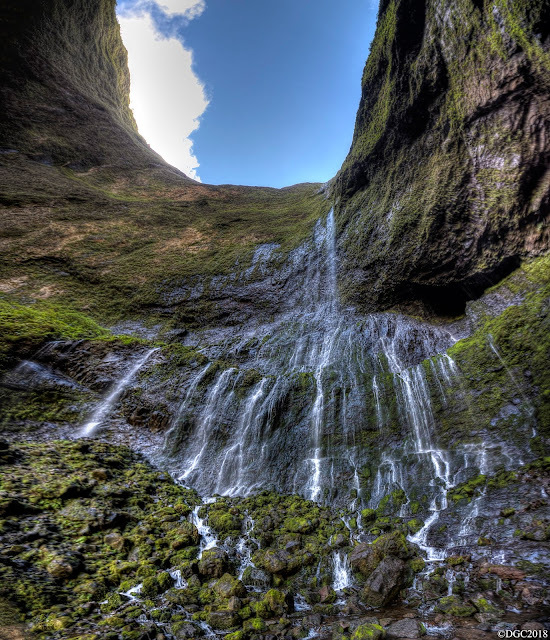 Unfortunately, it didn't take long for me to realize that this entire gorge is inundated with tour helicopters flying in and out through the gorge to reach the head waters. The sounds of the helicopters flying over us is nonstop. I mean nonstop from around 8am to around 5pm. This unfortunate helicopter train as I would call it destroys the otherwise tranquil feeling of being alone in the heart of Kaua'i. However, later in the day, we would discover that at around 11am to around 1pm, there is a lapse in helicopter flights as it is the pilots' lunch time! 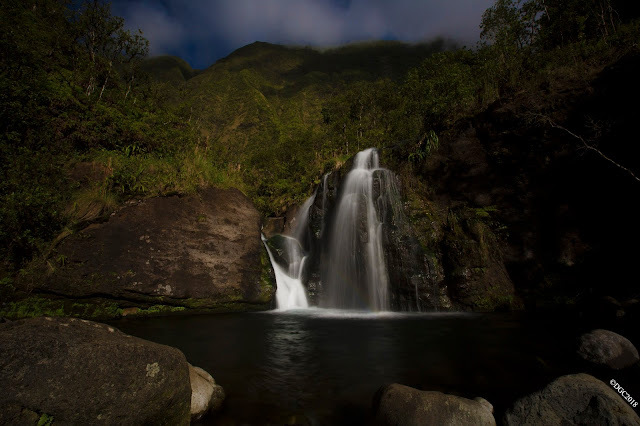 At some point, you'll reach a prominent waterfall that is known as the "Guardian Falls". I also heard people call it the "convergence" falls as three different streams converge together at this falls and becomes one river downstream torwards makai. 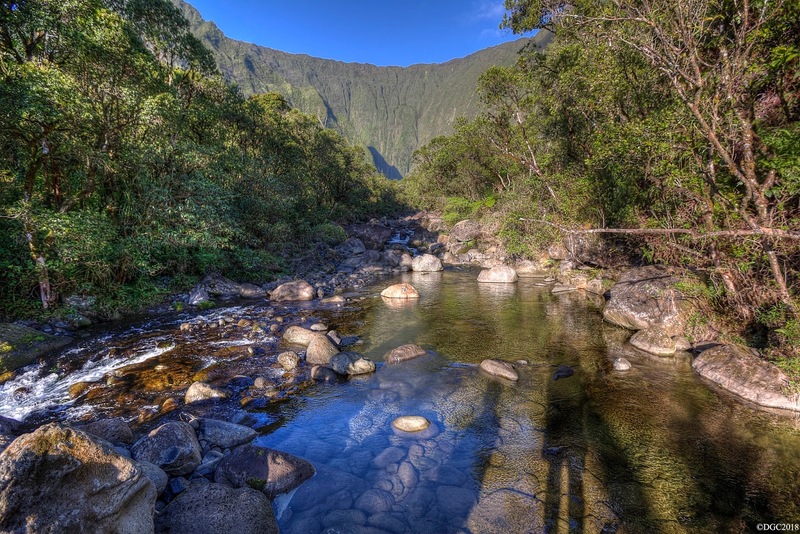 Most people who hike up this river turn around at this point. 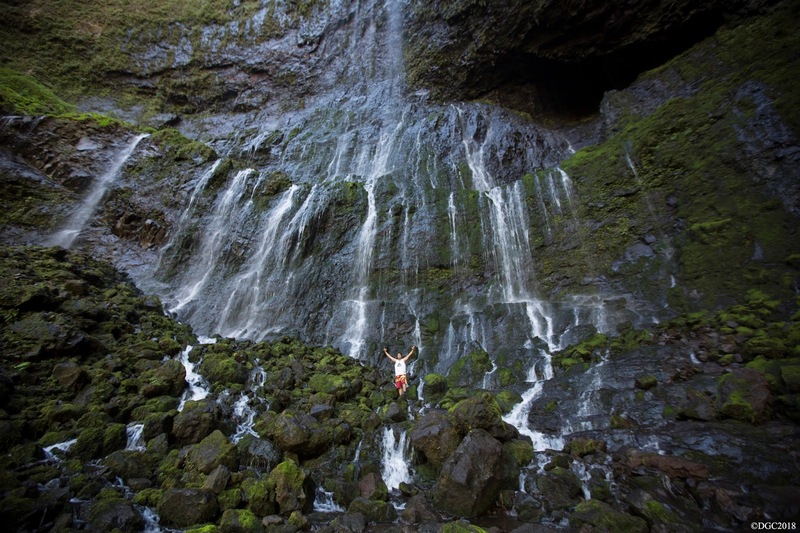 But if you want to reach the Wailua Headwaters, continuing upstream past this falls is a must. But this part can be confusing as you literally have three choices of streams you can take to follow upstream. Andrew easily guided us to the correct one and we were on our way. Beyond the Guardian Falls, the view of the right side of the gorge comes into view. 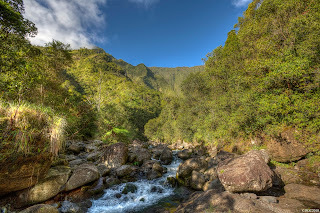 I began to think about the numerous rock hazards that I've experienced at the Kaluanui Gulch enroute to Kaliuwa'a Falls back on my home island of O'ahu. 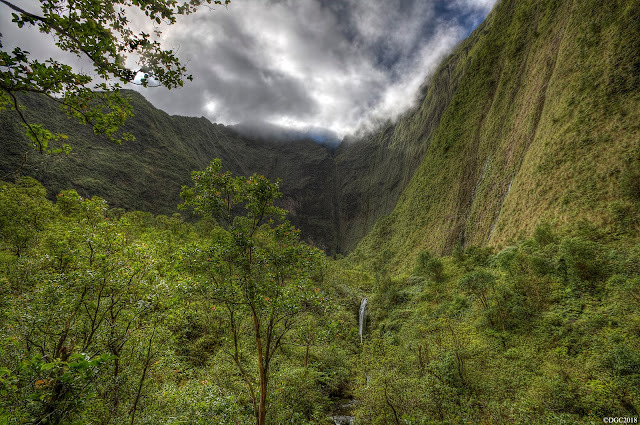 With the Wailua Gorge so sacred here on Kaua'i as we are essentially heading to the center of the island, showing our greatest respect and dignity to this place is of utmost important. This entire gorge is millions of years old and when one walks through here, you are essentially walking back in time to ancient Hawai'i. The mana is powerful and we all felt it's presence, channeling through our spirits as it did through our Hawaiian ancestors when they walked this very route. I had nothing but positive energy flowing throughout my body. It was a calling to be in this very special place. At around the halfway point of this second part of the hike, we had to start navigating some rope sections and ledges that required careful foot placement. It was said that a child slipped here while en-route to the Blue Hole and survived, but injured badly. It is probably about a good 30 to 50ft straight down into the shallow stream. Grabbing hold of vegetation on the walls proved futile. 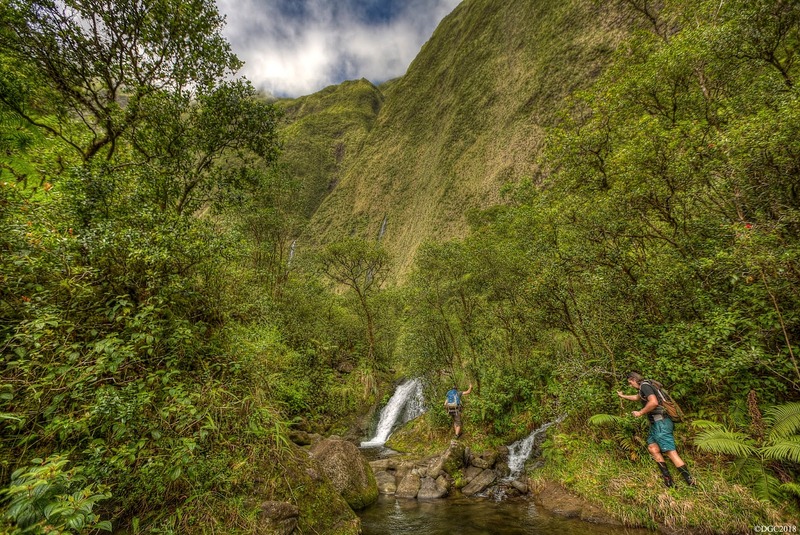 This reminds me of the section that we had to contour on the Kalihi Saddle from Lanihuli down towards the powerlines. It's sort of like that. Beyond these ledges is a mud slog through some minor ups and downs on the valley ridge spurs. More rope is present. We made sure to test all the ropes. There is a clearing as the gorge finishes it's left hand turn to line us up to the head waters. To the right, a 300ft waterfall rages down a vertical lush green cliff. To the left and now ahead of us, was a dark region of mammoth towering walls that comprise the famous Blue Hole "crater" of Mt. Wai'ale'ale. We could see the train of helicopters continuing to fly over head and straight into that dark void as if it swallowed those tiny flying specks and the tourists along with it! Nonetheless, we had to take a nice break here and take in these majestic views. Continuing on, we dipped down into small gulley and hiked up to a metal fence line that I am all too familiar with on O'ahu. It appears that this was the official boundary of the headwaters and the rest of the gorge heading downstream. There was a gate that we opened to go through the fence to finally reach the headwaters themselves. And there it was, all in her full glory on this beautiful partly cloudy sky as the sun beamed down overhead! The green dark walls were huge! They were at least 3,000ft tall on all three sides of the headwaters! I have never seen anything like this anywhere in the world. I was in shock. I was in awe. All I could do was just stand there and look at this place from 360 degrees around. For years I have always imagined this place. On this day, I was truly here. It didn't take long for me to spot the famous "Weeping Wall" at the far end of the headwaters. It was around past 12pm when we sat down to have lunch while admiring the towering walls high above us. I noticed many long streaks of dark rock that lacked any green vegetation. 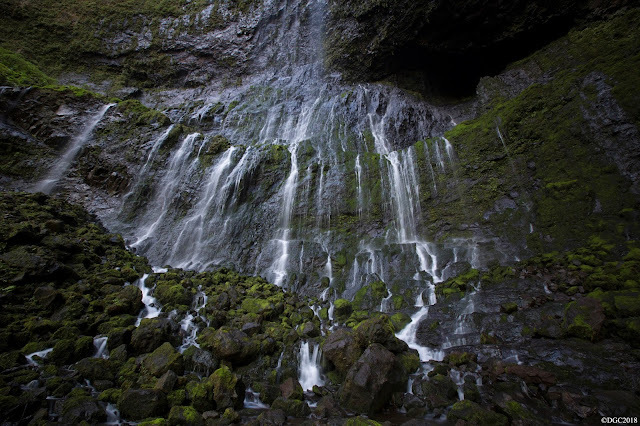 I recalled photos and videos from helicopters of endless streaks of gushing white waterfalls dropping down the entire face of the walls all around this area during a huge rain event. 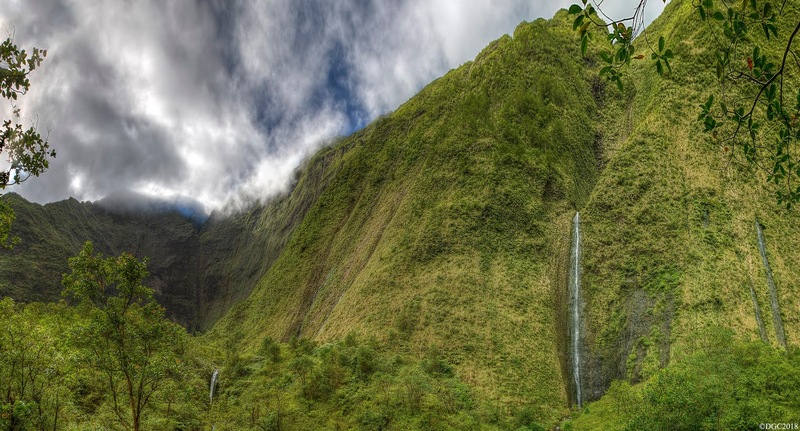 I can only imagine looking straight up at each of these thousands of foot waterfalls pouring down the edge of the surrounding Mt. Wai'ale'ale on all three sides! 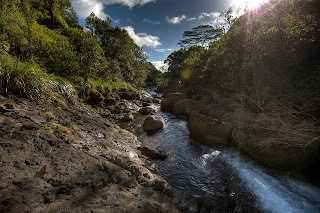 I probably need to come back here during an event where it just stops raining hard by the time we reach the headwaters. A risk worth taking? Probably. Or probably not! At around 12:30pm, we were at the many small cascading waterfalls that make up the entire Weeping Wall. 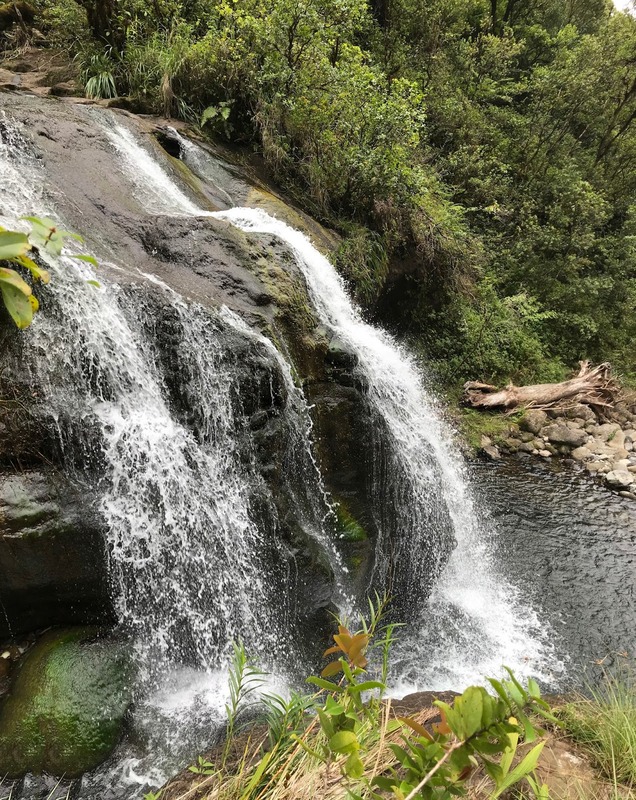 Even when it has been dry for the past 2 weeks, this waterfall always flows as it comes straight out of the ancient rock. I couldn't help but walk up to the waterfall, reach my hand forward through the flowing ice cold water, and touch one of the oldest rocks on the Hawaiian Islands. My spiritual energy was overwhelming at this point that I almost created my own weeping wall from my eyes. From the entire time we arrived at the waterfall, the helicopters were completely absent as we timed our arrival with their lunch break. All on cue. Under a blue sky. At the Blue Hole in complete silence with nothing but the sound of the water weeping out from the sacred rock. It all aligned. It was meant to happen. I felt it. I would find inner peace for the next half hour. We've reached the center of the island. It was an island, within an island. We probably spent about a good 45 minutes to almost an hour here before we had to reluctantly had to start thinking about heading back home. At around this time, the sounds of the helicopters returned with a vengeance and like an eclipse, totality was lost and the alignment was all but gone. This place was telling us to go back and we wasted no time as we had a long journey back to the safety of the truck. Every rock we hopped on, we had to do downstream. It was a painful struggle as these tabis are not exactly the most comfortable piece of footwear I've ever worn. My left heel started to hurt and my toes were bruised from the relentless hopping. But it was another 3 to 4 hours to get out safely. At a pool about 30 minutes above the Guardian Falls, Andrew recommended we all dip into the cold icy pool to freshen up for the final half of the hike. It was a welcoming break we all needed. At last I could put my sore feet into the water. 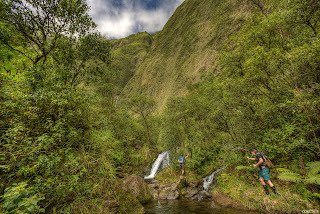 Once we got down to the Guardian Falls, it was just simply putting one foot over the other, or in this case, hopping on one rock to the next until we reached the truck. Looking back, we could see the cloud cover already shrouding the mystical mountain of Wai'ale'ale, as if performing it's curtain call to us. Jerry picked me up at our rendezvous spot and treated me to a dinner at "Chicken-in-a-Barrel" and wolfed down my entire chicken breast and the carbs that was served along with it. The time was about 7pm when I ate my last piece. We drove back to our motel, cleaned up, and slept like a baby. Checking out the next morning and returning our rental car was a breeze and we were on our way back to reality that is O'ahu. 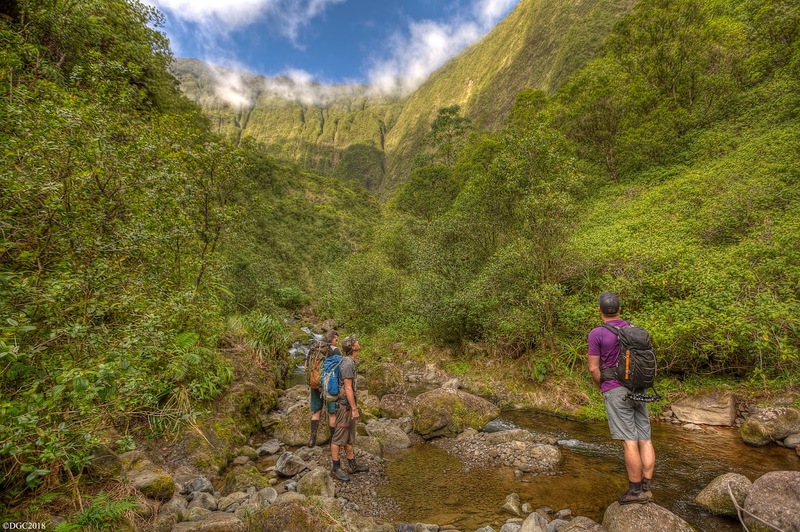 I want to thank Vladimir Constantine for inviting me to this hike and to Andrew Hewitt of Kaua'i Hiking Adventures to leading us safely to the headwaters and back. And of course, I can't forget Jerry Mendiola for playing mobile base camp for us! This will be a hike to remember for quite some time. It ties my #1 hike of all time with my hike out to the Kalapana Lava Flows back in 2013. Both of these hikes will forever be special to me and I will never forget those moments.